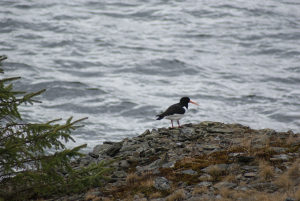 Observation - Oyster Catcher - UK and Ireland. Description: Medium size (40cm) black and white bird, distinctive long red/pink bill, pink legs, red eye. Medium size (40cm) black and white bird, distinctive long red/pink bill, pink legs, red eye.